Sunbrella® Replacement Cushions for Tropitone. 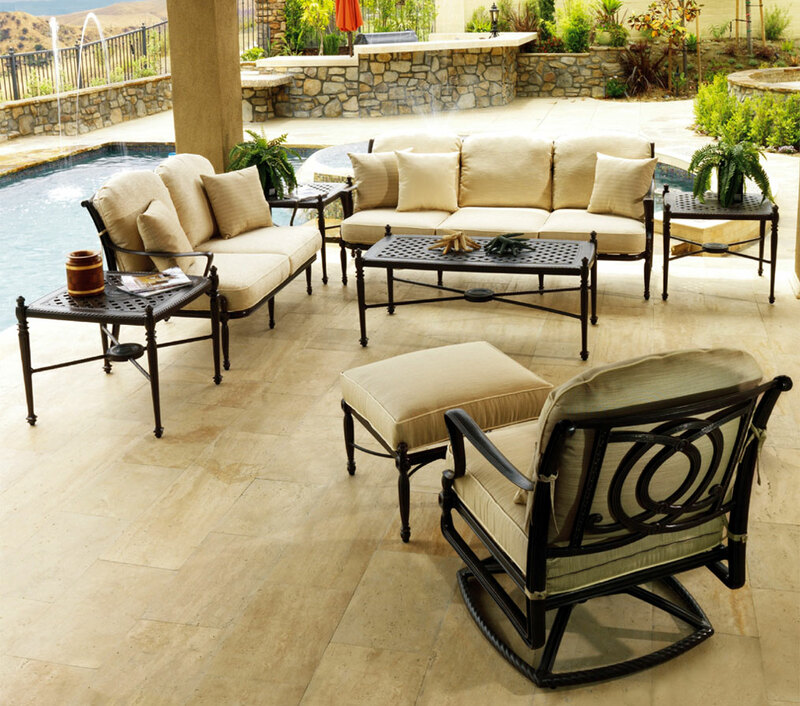 Sunbrella Outdoor replacement cushions for higher end brands of outdoor furniture such as Tropitone can be extremely expensive when purchased through Tropitone dealers and cushion sites. Quality Sunbrella replacement cushions for Tropitone don't have to be overpriced. We've been making Tropitone replacement cushions INDEPENDENTLY for years and many customers say they are BETTER than their originals. I love my new cushions!!! They fit my Tropitone furniture perfectly! You saved me hundreds of dollars for a superior product!! Thank you for working so diligently with me to get them perfect. Cushions proudly made using Sunbrella fabrics; Cushions not made by Glen Raven Inc. (Sunbrella) or Tropitone. Call us at: CELL: 909-758-6179. Provide style of furniture. Forgot style? - We can identify. We will assist in fabric selection & discuss update options such as: Reversible Ties, Thicker Cushions... We will then return email a detailed proposal replicating all details of original OEM cushion. In many cases, we can make it BETTER. We do NOT make fiber filled "knock-offs" that are pervasive in the industry. Simply indicate the name of your collection, number & type of pieces in your collection by filling out the "Comments" section then send request. We will return bid including shipping in an A Grade Sunbrella Fabric. We will then provide you a link to ALL Sunbrella Fabrics after you send the request and provide the opportunity to select from 360 Sunbrella Fabrics. After 30+ years of making replacement cushions, we do not require comprehensive measurements or paper templates.... we KNOW what we are making. However all cushions aren't necessary the same -- manufacturers change / update cushions and frames periodically -- sometimes a quick MEASURE CHECK is necessary to assure we have the correct pattern. GREAT AMERICAN COMPANIES innovate and improve -- they do not copy or replicate mediocrity. We find nothing extraordinary about most original manufacturers' cushions. Consequently we generally improve via... High Density Foam, Gore UV Thread which will outlast the fabric itself, adapt sew pattern to alleviate stress on single seams (add full side gusset or panel), velcro insert ties, make all cushions fully reversible (flip) so they LAST longer. Since all cushions are ultimately custom, we TALK with every customer to assure BEST cushion. 1) The most experienced person available will answer the phone. Everyone answering the phone has hands on production knowledge -- We don't use telephone operators or email employees talking with customers. (Rain - Seattle, Mildew - Florida, Sun - Phoenix). Do you want to replicate or change the ties? Do you want your cushions fully reversible? Do you want to customize the firmness of your cushions? 3) If you want to order after receiving email proposal, Call (909) 758-6179 -- we will check details, take credit card number (SSL Secure) and shipping address. (never email your credit card number.) We then send you an extremely detailed email receipt confirming: Fabric Selection, Collection, Measurements, Desired Firmness, Sew Pattern, Type of Ties Desired and any custom options such as Sta-Dry Liners, amount of invoice, shipping address... Any corrections / changes must be emailed to us within 24 hours or your order will be final. 4) If we have any questions, we will send them in your order confirmation. We have OEM templates in stock and simply want to see if you have an early or late model frame series or perhaps a high back cushion version. If you don't want to do this, we suggest you purchase the cushions from the original manufacturer with the item number appearing on your original receipt (you might want to compare prices before doing so.) Refer to our testimonials if you have any reservations about the ultimate quality or fit. I was amazed at how much better looking and more comfortable your cushions were than originals. I was hesistant to order because your prices are so much lower than other [High-end brand deleted] sources. "Guess some folks just aren't happy unless they get hosed." Online customers shop for price & convenience. Ordering expensive or in-expensive cushions made incorrectly is not convenient. We expedite the ordering process by requesting that you fill out & submit an order form, but we insist on talking with you before accepting any money to confirm details. Read other websites disclaimers. You don't get a second chance to make it right. ** Some high end Sunbrella fabrics can increase the price of your cushions by 50%. * Cushions not made by Tropitone or Sunbrella Glen Raven Mills. We are an independent manufacturer using Sunbrella fabrics exclusively. Make sure you're getting the selection & quality you deserve. Online customers shop for price & convenience. Ordering cheap or expensive cushions made incorrectly is not convenient. We expedite the ordering process by requesting that you fill out & submit an order form, but we insist on talking with you before accepting any money to confirm details. Read other websites disclaimers. You don't get a second chance to make it right.